In Storyboard Pro, you can track changes in the storyboard’s panels. This allows the storyboard artist to integrate any comments the supervisor has made, and the supervisor can easily track any changes and validate or comment on them. Storyboard Pro lets you automatically detect any changes in your project, and adds a visual notification in the Thumbnails and Timeline views. ‣ Select Storyboard > Track Changes > Auto Tracking Mode. Once the Auto Tracking Mode is enabled and you edit a panel, a yellow rectangle appears around the panel in the Thumbnails and Timeline views. This visual indicator allows the supervisor to rapidly locate any panels which have changed. A new temporary caption field is added to the tracked panel's Panel view. You can add notes to the Revision Notes caption. Note that the text you type here will also be displayed in the Track Changes dialog box during the validation process—see Validating Changes. You can also track changes by date. If a storyboard becomes very large, it may be easier to track changes made on a specific date. This dialog box contains options to help you track changes even more efficiently. The Search by Date dialog box opens. Use the From and To fields to define a particular time range in which to track changes. If you want to track changes done on one specific day, place that day’s date in both the From and To fields. Click the From button and select the first date. Only the dates at which a change occurred will be available. The other dates will appear dimmed. Select the first date and click OK.
Repeat these steps to select the To date. ‣ The first line displays the number of panels found in the storyboard that have been modified during the defined time range, and the panel that is currently selected. ‣ In this example, five panels fit the description, and the first panel of the five is currently selected. ‣ The second line displays information about the currently selected panel, such as which scene it is part of, the name of the panel, and the date it was last modified. Use the Next and Previous buttons to jump from one modified panel to the next. You can use the drop-down menu in the bottom-left corner to modify the status of the selected panel. ‣ Mark as Changed: Marks the currently selected panel as being edited on the current date; this is the default option. Simply click on the button to activate it, no need to open the drop-down menu. 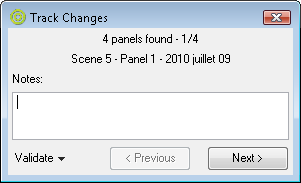 ‣ Mark Scene as Changed: Marks the scene of the currently selected panel as being edited on the current date. ‣ Mark All as Changed: Marks all the storyboard panels as being edited on the current date. When you use the Auto Tracking Mode feature, you can use the Validate Changes option to follow up on these changes. Select Storyboard > Track Changes> Validate Changes. The Track Changes dialog box opens. ‣ The first line displays the number of panels found in the storyboard that were modified while the Auto Tracking Mode was enabled, as well as which of the panels that fits the description is currently selected. ‣ The second line displays information about the currently selected panel, such as which scene it is part of, the name of the panel, and the date it was modified. Use the Notes field to enter text about the selected panel. This information will be available in the tracked panel Panel view in the Revision caption. If notes were added in the Revision Notes caption field, they will be displayed in the Revision Notes field of the Track Changes dialog box. NOTE: This caption is temporary; it will be removed when the change is validated. ‣ Validate: Validates the currently selected panel. This is the default option, simply click on the button to activate it, there is no need to use the drop-down menu. ‣ Validate All: Validates all of the panels in the storyboard. Click on the arrow button to display the drop-down menu and activate the command. ‣ Validate Scene: Validates the scene that the currently selected panel is part of. Click on the arrow button to display the drop-down menu and activate the command. Use the Next and Previous buttons to navigate from one tracked panel to the other. NOTE: Refer to the Automatically Tracking Changes section to learn about the Auto Tracking Mode feature and how to enable it.